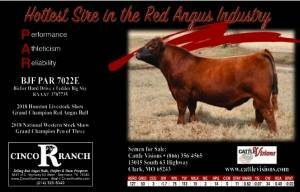 PAR 7022E wss an instant hit in the Red Angus Breed as a part of the 2018 National Western Stock Show Grand Champion Pen of Three and then being named Grand Champion Red Angus Bull at the Houston Live Stockshow & Rodeo. Sired by Bieber Hard Drive out of a Feddes Big Sky cow. 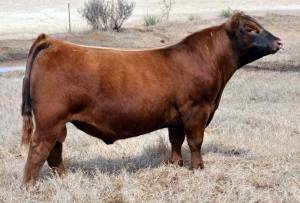 PAR is athletic, free moving, deeped sided and possess a top 10% Gridmaster, Wean Weight, Yearling Weight, and Carcass Weight, along with a top 20% Marbling, Yield Grade, Ribeye Area, and Fat Area Thickness . 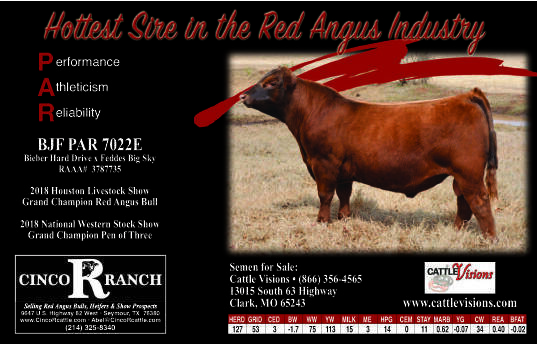 PAR is the answer for the Commerical Cattleman looking to add body mass and carcass merit to his herd. The Registered Cattleman will appreciate his balanced EPD's, natural muscle along with his great feet and physical soundess. The Showman looking for a prospect will appreciate his unparalleled Phenotype, free moving easy gait that covers his tracks, long spine, gentle disposition, and expansive rib shape. PAR is undefeated in the Show Ring winning Grand Championships in his first two events of his career at Denver and Houston.